The special counsel's trail has twisted through talk of political dirt at a London bar, salacious allegations and criminal charges against 34 people. 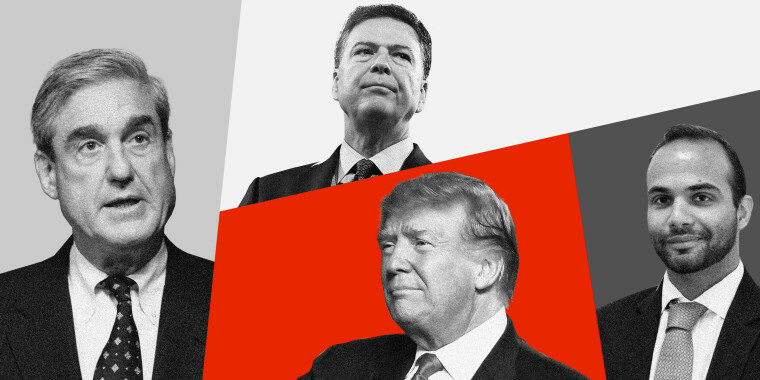 How will President Trump respond to Mueller report? Mueller’s appointment was hailed by Democrats and Republicans, with then-Rep. Jason Chaffetz, R-Utah., praising his "impeccable credentials" and Sen. Susan Collins, R-Maine, calling him "above reproach." Trump repeatedly referred to Mueller’s investigators as "angry Democrats," although Mueller is a Republican, as is Rosenstein, who oversaw the investigation. And the president singled out some who'd been assigned to the case by name, including FBI agent Peter Strzok and bureau lawyer Lisa Page. Strzok was reassigned after it emerged that the two, who were having an affair, had exchanged texts criticizing Trump, while Page had left her brief detail with the special counsel's office before those texts came to light, a Mueller spokesman said. At one point during the campaign, Trump even publicly asked for hackers' help. "Russia, if you’re listening, I hope you're able to find the 30,000 emails that are missing," he said at a news conference in July 2016, referring to emails Clinton had deleted. Trump later said the comment had been a joke. Trump — who’s unleashed his brash, trash-talking style on friends and foes alike — tweeted about Putin as early as June 2013 as he was preparing to bring his Miss Universe pageant to Russia, asking if the Russian president would "become my new best friend?" Flynn had sat with Putin at a dinner for the Russian government-funded television network Russia Today in Moscow in 2015, and neglected to report that he'd been paid for the appearance on his security forms. He would be fired from his job as national security adviser for misleading Vice President Mike Pence about his conversations with the Russian ambassador to the United States. Comey later told Congress that Trump had urged him to drop the FBI's investigation into whether Flynn lied about those talks to investigators; the president has repeatedly denied Comey's allegation. He's contended the entire Russia probe was illegitimate because it used a dossier of reports compiled by a former British spy, Christopher Steele. Steele was hired by a research firm, Fusion GPS, that initially had been retained to get information on Trump by a conservative website, The Washington Free Beacon, during the primaries. After Trump secured the nomination, the Clinton campaign and the Democratic Party started paying for Fusion’s research, at which point the firm hired Steele. Trump has also sounded off in ways that legal experts say could be seen as pressuring witnesses in the case. He has publicly weighed the possibility of giving Flynn a presidential pardon, and praised Manafort for initially refusing to cop a plea — even though he'd been convicted of cheating the U.S. government out of millions of dollars in tax revenue.